The humble weaver who lovingly crafted a silk saree wouldn’t have imagined that his six-yard masterpiece would ascend 15,000 feet and unfold its splendour on the snow. Neither would have Yash Chopra imagined that a diva would proudly flaunt her Kanjeevaram saree in picturesque locales, rivaling his chiffon-clad onscreen snow queens. For the first time in the world, Palam Silks and Makka Studios came together to capture South India’s silk tradition against the backdrop of the Spiti valley. The grandeur of the imagery may seem effortless, but it took superhuman effort. 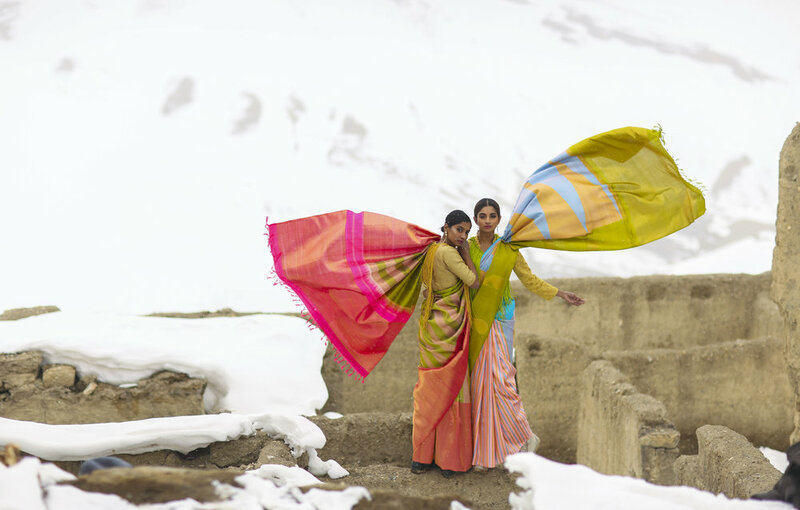 Two brave beauties did the unimaginable in bone chilling -18o C weather – while longing for heavy woolens, they chose to pose in vibrant silk sarees with mesmerizing grace. Silk meets snow meets femininity in a breathtaking bouquet of frames. The frames paint the magnificent white canvas of the Spiti valley with a rainbow of shimmer. India’s legacy of silk reaches the heights of glory.